Written by Dezza, 16 November 2017. In last week’s blog, we talked about the Mt Pinatubo Tour and the amazing fun and adventure we had along the way. Deztiki Tours had grown from only 8 people on our first trip, to 32 people two weeks later when we embarked on the Mt Pinatubo tour. When we started looking for some good Philippines destinations in which we could do weekend day trips, we didn’t expect that we would end up on a bus with 32 people! However, it was becoming increasingly popular. Our group of friends were talking about our trips and were starting to get more and more interest. Enter Rizal Province. Having been on a pretty difficult hike on our first-day tour to the beautiful Buntot Palos Falls and then Pinatubo Volcano for our second-day tour, this time around we decided to check out an underground cave and two separate waterfalls, both very close to each other. So after speaking to a few of the people that came on the Mt Pinatubo trip, there was a lot of interest to join us for our latest tour. This time, we ended up with 35 people who were keen to roll with us. The date was set. So, on February 14, 2015, we did our usual meet up in Fort BGC. We hired a bus and loaded it up with refreshments and headed off to Tanay in Rizal Province, which is on the other side of Bay De Laguna in the Calabarzon Region. I hadn’t been to this place before so I didn’t know what to expect. I had read some travel blogs about some cool Tanay Rizal tourist spots and it sounded great. It had some of the most beautiful waterfalls I had seen and some caves. It was located fairly close to Tanay Adventure Camp, so I thought it was worth checking out. Entering Calinawan Cave. It’s nice having daylight breaking through the roof to give you a better view and the weird shadows and shapes. Calinawan Cave is the name of the cave. It’s an underground cave, and a few kilometres away there was the two waterfalls Daranak Falls and Batlag Falls. So with me acting as the tour guide the bus first headed to Calinawan Cave. The road to the cave was pretty narrow, so we had to jump off the bus and walk from there to the cave. Once we passed the narrow part of the road, it actually opened up and became a sealed ride. It was possible to drive on this road by car, but not the bus. The walk to the cave took us about 40 to 45 minutes. 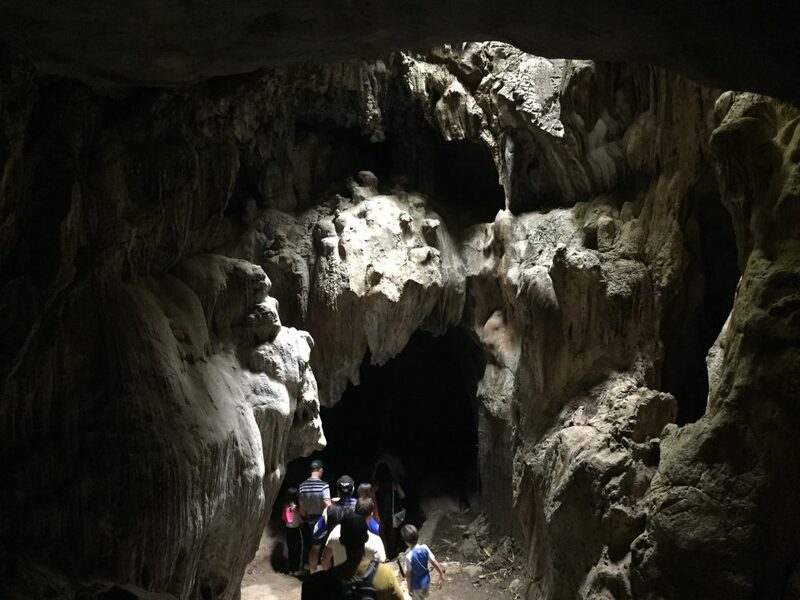 Calinawan Cave is a privately owned so there is a nominal entry fee to pay of P20/person. The cave entrance has concrete steps that lead you down into the darkness of the cave. The cave is a multi-level cave system that has several chambers and the usual stalactites and stalagmites that you would find inside a cave. When I was doing my research I read that the cave was actually used as a hideout during the Spanish-American War and also the Second World War. The cave has also been used in a number of local television programs and films. You are required to have a guide to take you through the cave which is good as they have a flashlight with them. Some more spectacular rock features carved into the walls of the cave. There are several chambers within the cave however, some are not safe for visitors. There were some amazing rock formations inside the cave with faces seeming to appear in the rocks and cave walls. It took about 45 minutes for us to complete the tour of the cave. The exit of the cave is at the opposite side of the area to the entry. From there we walked back to the bus and took the short drive to Daranak Falls. Set in the foothills of the Sierra Madre mountain range, this is a beautiful waterfall that has a vertical drop of approximately 20 metres. The water gently cascades down the rock face into the rock pool below, which is a beautiful turquoise colour. This place is unlike Buntot Palos Falls or even Pagsanjan Falls in that the car park is very close to the waterfall so you don’t really have to take a long hike to get to the waterfall. There is also a kiosk selling food, drinks, and souvenirs. There is adequate signage so you can’t miss it. 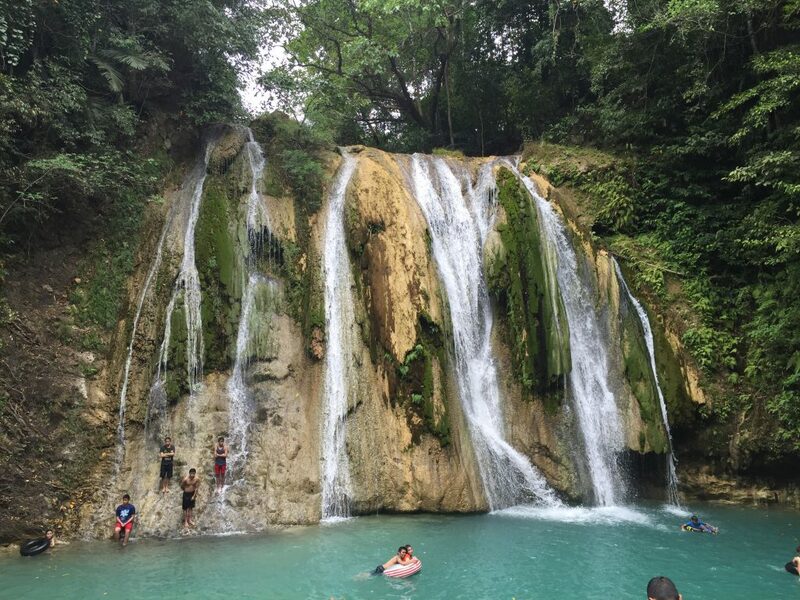 Daranak Falls is a classic style waterfall with a wide face and a strong cascade of water. This is a very popular location for locals of Rizal Province. The place was pretty packed with families enjoying the water and relaxing. There weren’t any foreigners there aside from our group. The waterfalls water empties into a small stream which becomes the Tanay River. On the banks of the stream, there were picnic areas set up for people to sit and relax. As we were a fairly large group, we all decided that we would separate and do our own thing. There was only really one entrance to the place so we weren’t really out in the middle of the jungle where would be easy to get lost. 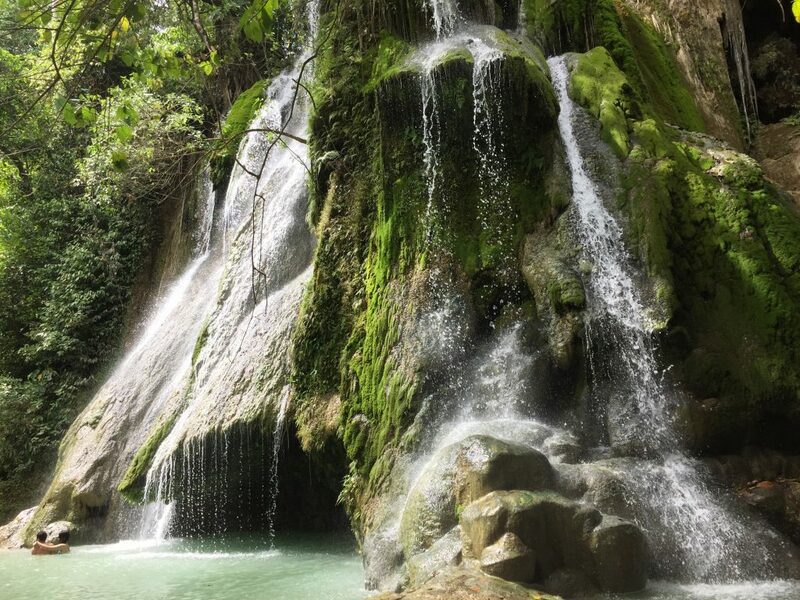 Some of us grabbed some of the picnic spots near Daranak Falls, while others decided to go and check it out Batlag Falls which is only about a 5-minute walk away from Daranak falls. As a matter of fact, the water that flows into Daranak Falls actually comes from Batlag Falls. Batlag Falls has to be one of the most beautiful waterfalls I have ever seen. This photo is only one part of it. Personally, I think Batlag Falls is better than Daranak Falls. It is a multi-faced waterfall and very elegant and graceful. There were a few tables near the bottom of it where people could sit down and have a picnic which is what I did with my family and a few of our friends. There weren’t quite as many locals at this waterfall which made it better for us. After having some lunch we decided to take a swim. Batlag Falls is truly amazing as you are able to go underneath the waterfall as there’s a ledge there that you can go under and shelter yourself from the flowing water of the falls. Eventually, those from our group that stayed at Daranak Falls gradually made their way to Batlag Falls. After spending a couple of hours at Batlag Falls, we made our way back around to Daranak Falls. A few more photos and then it was across the stream and back to the bus. Everyone had a great day and were all pretty excited about the trip to Rizal Province. There were quite a few families that came on this trip and everybody said it was a great location for a family getaway. 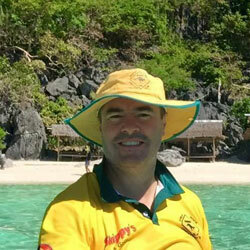 A number of us vowed to come back and recommend it to friends and family as one of the best places in the Philippines. You can see YouTube video about this adventure by clicking here. As usual, the drive back to Manila was a good one as we listened to music and drank some beers on the way back to help relax and kill some time. Its always a great bonding opportunity on the way back and the bus tours are almost the highlight of the trip! In next weeks blog, we will read about an amazing National Park in Bulacan named Biak Na Bato. 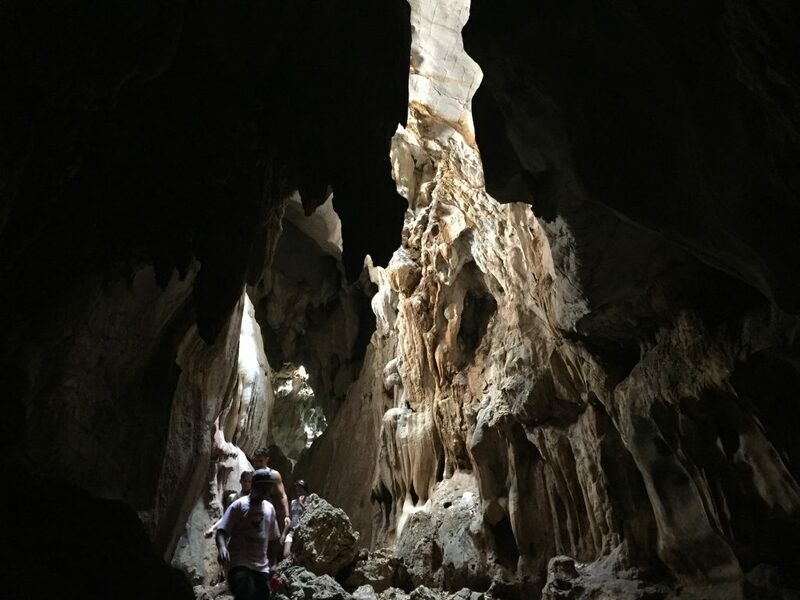 This national park features some of the most amazing cave networks in the Philippines. For those without a car, from Starmall in Mandaluyong, there is an FX/van Terminal on Shaw Boulevard. From there you can ride an FX/van bound for Tanay, Rizal for P70. The van stops at the Tanay Public Market in Rizal Province and the travel time is about 1.5–2hrs. From Tanay Public Market, you can hire a tricycle going to Daranak Falls for about P100 one way. Go to Calinawan Cave first, and then go to Daranak Falls (and Batlag Falls), which is only about 5-6kms away. If you are feeling adventurous, you can easily walk it in about one hour as most of the roads are paved and in decent enough condition to walk. This would be an ok trip for kids over the age of about 10. My suggestion is to also bring a picnic lunch and drinks. Alcohol is prohibited.